It’s the May Bank Holiday weekend in Ireland. The feast of Bealtaine has passed. Some of the folk around here would have washed their face in the dew, built small bonfires and cleansed the house (although this doesn’t happen so much in a residential area) and yellow flowers would be left outside the door of family members and friends. We don’t do the flower thing so much either. The beauty of a Bank Holiday weekend is that it gives me a chance to make a big roast dinner on the Sunday. I rarely cook a family dinner on Sundays, it’s the one day of the week when I try to take a break from big meals and catch up on batch cooking and baking. Sure I can do that on Monday! 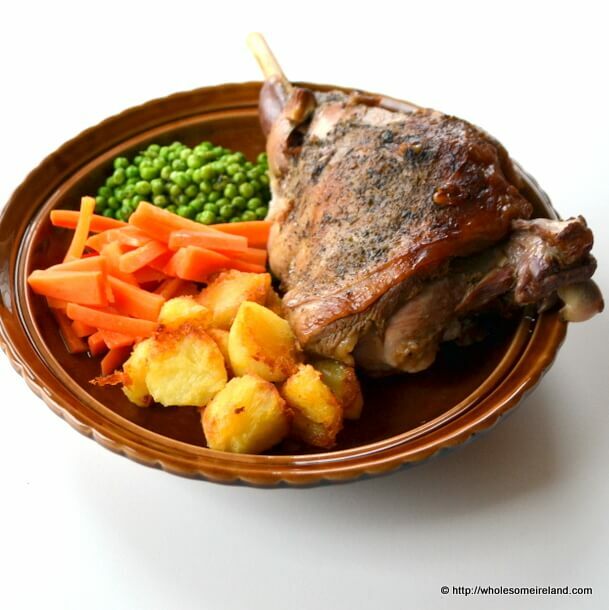 Lamb is in season so why not make the most of it with my slow roast leg of lamb? May in primary school when I was growing up was an exciting time. We all added to the May “table” in turn. We kept it decorated with flowers and other offerings to the Virgin Mary. Yes most schools at the time were very Catholic (I’m not sure that much has changed). The songs at Mass would change to some very uplifting devotions and the flowers would start to blossom. Nowadays at this time of the year I’d simply be celebrating the impending Summer harvest but as the ground has been very slow to warm I’m still waiting! I might as well nudge along my optimism with a great Spring roast. This is not so much as a recipe but a timeline so that you can prepare your dinner in advance with minimal fuss. Add whatever vegetables you like. If you’re serving peas, add a teaspoon of mint jelly to them before serving. It’s a great way of getting kids to try them. If you really want to make life easy on yourself then use frozen peas and sweetcorn as your additional vegetables. They only need heating right through which won’t take long at all (about 5 mins plunged into boiling water then drained) and they are often higher in vitamins and minerals than fresh because of the freezing method. Preheat your oven to 150 degrees Celcius. Boil a kettle of water. Peel 4 medium potatoes and slice them into thick slices (about 2cm depth). Spread them evenly over a deep roasting dish. Remove the leg of lamb from the packaging and rest on top of the potato slices. Using a sharp knife, poke a few holes over the flesh and shove in about 7 garlic cloves. If you don’t like garlic don’t bother with this step. Sprinkle liberally with black pepper, salt and dried herbs. I know some people don’t like dried herbs but it’s very hard to find fresh local herbs after the cold Spring so dried are fine. If you’re lucky enough to have fresh, go right ahead! Pour approximately a pint of hot water into the roasting dish. Carefully seal the top of the dish usinga few layers of tinfoil. Stick the leg of lamb in the oven. Close the door. Remove the lamb from the oven. Carefully lift the leg to a warm serving dish. Cover with tinfoil and leave to rest for 30 minutes. Lift the (now smushy) potatoes from the roasting dish. Pop them in with any mashed potatoes you’re preparing to give them an extra lamb flavour. Strain the juices from the bottom of the roasting dish into a small saucepan and reduce the juices by simmering on medium until the quantity has halved. While still simmering, stir in a little cornflour that has been dissolved in cold water and stir well until the juices thicken. Season to taste and this will be your gravy. PS: If you’ve got any meat at all left on the leg, even crumbly bits you might want to consider making my leftover lamb pasta. You just brought back a long forgotten memory of the May table. And singing “May is the month of Mary” as we decorated it. I wonder if they still do that there? Hi IrishMum I’m not sure as my boys aren’t quite of school-going age. I’ll ask the questions on my FB page & see what the response is like then get back to you. Oh great Mark. I hope you enjoy it! I’m going to try your recipe today! I’m a lamb fan, so wish me luck! Thanks for posting this. I am thawing out my Boneless Leg of Lamb (5lbs) now!. Oh I hope it went well! Happy New Year!